There is a new Amazon coupon code available! 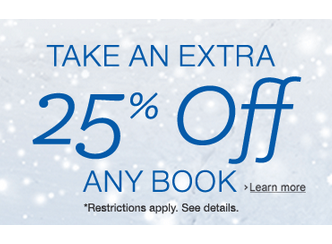 Use the code 25OFFBOOK to get 25% off any print book sold by Amazon. This is a great way to grab a gift for someone! The coupon code excludes Kindle eBooks and Audible Audiobooks, Book Rentals and Amazon Gift Cards. Shipping is free on orders $35+ or you can get free 2-day shipping with Amazon Prime. Prices on Amazon may change at any time. The coupon code expires 12/14. There is a limit of one per account. See more online shopping deals.